Explorer frame window base class. Definition at line 41 of file mainframe.h. Definition at line 43 of file mainframe.h. Definition at line 150 of file mainframe.cpp. Definition at line 289 of file mainframe.cpp. Reimplemented in SDIMainFrame, and MDIMainFrame. Definition at line 388 of file mainframe.cpp. The "Execute..."-dialog lets the user enter a command line to launch. Referenced by MDIMainFrame::Command(), and SDIMainFrame::Command(). Definition at line 40 of file mainframe.cpp. 65 // to avoid accessing prematurely freed memory in the PostMessage handlers. Referenced by MDIMainFrame::Command(), SDIMainFrame::Command(), explorer_show_frame(), and MDIShellBrowserChild::WndProc(). Definition at line 651 of file mainframe.cpp. Definition at line 558 of file mainframe.cpp. Referenced by MDIMainFrame::frame_get_clientspace(), and ProcessMessage(). Definition at line 616 of file mainframe.cpp. Definition at line 681 of file mainframe.cpp. Referenced by MDIMainFrame::go_to(), and Notify(). Reimplemented in ShellBrowserChildT< MainFrameBase >. Definition at line 457 of file mainframe.cpp. Definition at line 77 of file mainframe.cpp. Retrieval of file system paths of ShellPath objects. Referenced by DesktopWindow::OnDefaultCommand(), and ShellBrowser::OnDefaultCommand(). Definition at line 311 of file mainframe.cpp. Referenced by WndProc(), and MDIMainFrame::WndProc(). Definition at line 512 of file mainframe.cpp. Referenced by ProcessMessage(), and resize_frame_client(). Definition at line 551 of file mainframe.cpp. Referenced by Notify(), ProcessMessage(), and toggle_child(). Definition at line 634 of file mainframe.cpp. Referenced by Command(), and MDIMainFrame::Command(). Definition at line 586 of file mainframe.cpp. Definition at line 379 of file mainframe.cpp. Referenced by ProcessMessage(), and MDIMainFrame::TranslateMsg(). 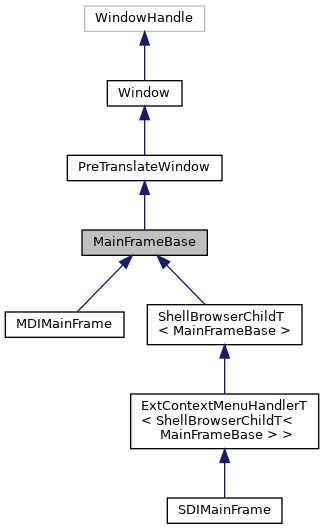 Reimplemented in ExtContextMenuHandlerT< ShellBrowserChildT< MainFrameBase > >, ShellBrowserChildT< MainFrameBase >, SDIMainFrame, and MDIMainFrame. Definition at line 301 of file mainframe.cpp. Definition at line 66 of file mainframe.h. Referenced by toggle_child(), and toggle_fullscreen(). Definition at line 68 of file mainframe.h. Referenced by MainFrameBase(), and TranslateMsg(). Definition at line 54 of file mainframe.h. Referenced by MainFrameBase(), resize_frame(), and SDIMainFrame::set_url(). Definition at line 58 of file mainframe.h. Referenced by FillBookmarks(), MainFrameBase(), and ~MainFrameBase(). Definition at line 69 of file mainframe.h. Referenced by MainFrameBase(), and ~MainFrameBase(). Definition at line 60 of file mainframe.h. Definition at line 61 of file mainframe.h. Referenced by MainFrameBase(), and MDIMainFrame::MDIMainFrame(). Definition at line 57 of file mainframe.h. Referenced by Command(), FillBookmarks(), MainFrameBase(), Notify(), resize_frame(), MDIMainFrame::resize_frame(), SDIMainFrame::resize_frame(), and ~MainFrameBase(). Definition at line 55 of file mainframe.h. Referenced by Command(), frame_get_clientspace(), MainFrameBase(), ProcessMessage(), resize_frame(), MDIMainFrame::resize_frame(), and SDIMainFrame::resize_frame(). Definition at line 53 of file mainframe.h. Referenced by Command(), frame_get_clientspace(), MainFrameBase(), MDIMainFrame::MDIMainFrame(), ProcessMessage(), resize_frame(), MDIMainFrame::resize_frame(), and SDIMainFrame::resize_frame(). Definition at line 51 of file mainframe.h. Referenced by MainFrameBase(), MDIMainFrame::MDIMainFrame(), ProcessMessage(), resize_frame(), MDIMainFrame::resize_frame(), SDIMainFrame::resize_frame(), and toggle_child(). Definition at line 63 of file mainframe.h. Referenced by Command(), MainFrameBase(), MDIMainFrame::MDIMainFrame(), ProcessMessage(), and toggle_child().